One of the many qualities of a successful restaurant is the art of timing a table’s meal effectively, so that courses are properly paced and for guests to receive their meal at once, without compromising freshness. It sets the tone for the entire dining experience. But how exactly? The expediter position, or “expo”. The person tasked with this role is in short, a conductor of the kitchen. The expo monitors the scheduling and quality of the dishes, such as the appropriate temperature, texture, and presentation, and orchestrates the stations behind the line in concert. I had the opportunity to go behind the scenes with Michael’s Genuine Food & Drink’s Chef de Cuisine, Niven Patel, to take a closer look at these intricacies and let you inside the controlled chaos of our back of house to see how the magic happens during service! Let us talk about the scenery. As soon as I stepped into the kitchen, I felt a rush. The cooks and chefs work with haste, but most importantly with passion. As the kitchen’s fearless leader, Chef Niven presides with calmness yet conviction. He believes that tone, confidence and respect, translate to accurate and passionate execution in the food. He is as focused, if not more so than his team, to set the example and build the group’s ammunition for a busy Saturday evening. The Genuine Kitchen holds four stations: wood oven, grill, sauté and pantry (otherwise known as salads). Despite the specificity of these duties, it does not prohibit a cook from one station to assist in another region of the kitchen when asked by the Chef. Teamwork is everything in this jungle. 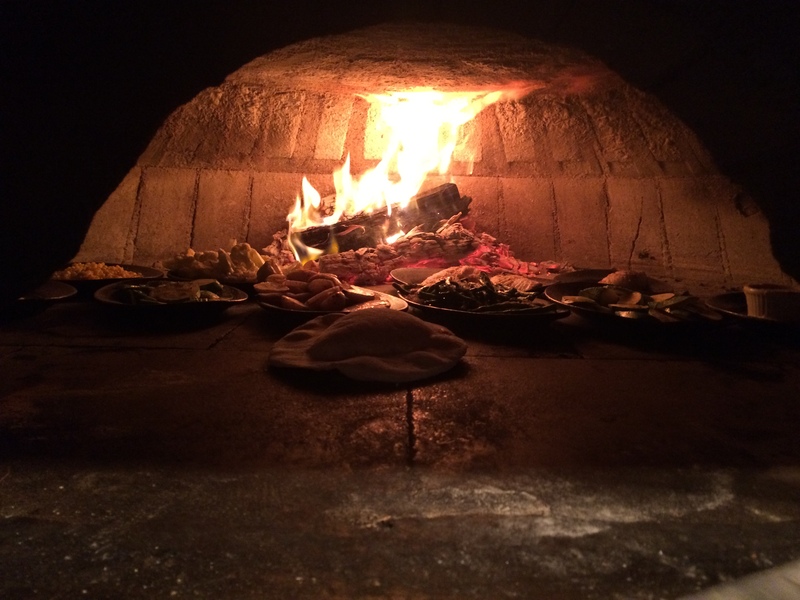 Our Wood Oven fires items or components of items from all across the Genuine menu, at once, delicately moved in and around hot spots until each is ready at different times by the cook on this station. Here it’s about half capacity. Between 7 and 9 p.m. the circus takes place, as these are typically the busiest hours of the night. Due to the rapidity of this point in service, kitchen language and non-verbal queues are essential. The Chef abbreviates certain dishes when calling them out to his cooks; therefore, every person must be very familiar with the menu to avoid kitchen errors: “two cauli, one pus, one 2.5, one shoulder SOS”, meaning two wood oven roasted cauliflowers, one chargrilled octopus, one 2.5 pound snapper, and one slow roasted pork shoulder with sauce on the side. “Got it?” “Heard!” This is how cooks respond to the Chef to ensure effective communication; a good memory will serve you well here. Or, the Chef may merely extend an olive bowl and a team member knows that it should automatically be filled with marinated olives, without uttering a word. It all goes down very quickly, but despite the speed, cooks must deliver in order to please the Chef, but most importantly the guest. As he continues to call out orders, the Chef keeps track of all items using slips, which stick on a long metal line. He uses a twistable blue crayon – Niven is very particular – to mark which items are complete. He groups certain tables to maximize efficiency and separates others to allow dinners to enjoy their appetizers, before bombarding them with the next course. At the expo “seat” (they stand) the designated person must anticipate the cooking time for all items and keep cooks on track. There are no timers. The Chef and cooks can determine exactly four minutes or seven minutes solely from their internal clock, and precision is key. Monitoring time does not only benefit the table, but it affects the performance of the entire restaurant. For example, staying on schedule for the first three tables helps with timing on the subsequent twenty tables. The Chef uses key words to hold the reigns, such as “on the fly”, to emphasize speed on a particular dish or “all day” to reiterate the number of the times a cook should execute a particular dish: “…all day, you have four groupers and two stracciatella.” All five senses are put to the test at the kitchen. The Chef can smell when a wood oven roasted double yolk farm egg is ready, determine the appropriate temperature of a steak by its sight, feel the ideal texture of crispy hominy, hear the printer emit the next order slip, and taste the level of spice on a pig ear. It truly is a science. A talented Chef or Sous-Chef at the expo position is vital; however, the restaurant only comes together due to our dream team. The conductor leads but the orchestra performs, which is the cooks, as their hard work is what leads to dishes that make you gasp. It also entails the food runners, those who deliver dishes from kitchen stations to the correct person at the table. They recognize any dish with a quick glance and understand its composition in order to inform the Chef of what they see at the window and accurately describe to guests what is presented at the table. In addition, a food runner may take over the expo position, sharpen knives, prepare breads, and debone snappers and chickens at the guest’s request, among other duties. The front of the house is also an important part of the expo equation, which includes the manager on duty (or MOD), servers, and host. The latter reaches out to the Chef to indicate when a large number of guests have been seated at once, otherwise known as a “push”, so that the kitchen may be prepared. Servers share the pace of their table, along with special requests, so that the kitchen can offer the best possible service. Last but not least, the MOD holds a great deal of responsibility, working to ensure any mistakes are seamless with the guest. As odd as these procedures may sound, they allow us to raise the bar for an unprecedented guest dining experience. Each role is a dance to develop a cohesive choreography in the restaurant and the expediter position is but one of many. “Teamwork makes the Dream Work” indeed.